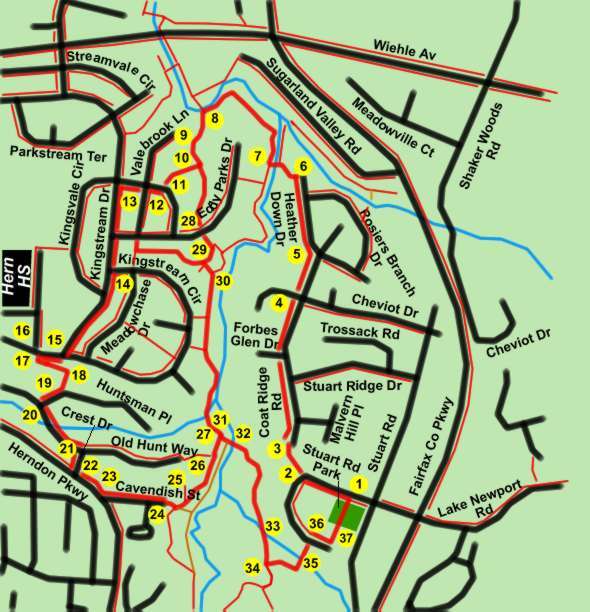 This is one of a series of walks utilizing the trail system within Sugarland Run Stream Valley Park. See that section of this site for a map of the full area. This walk explores some of the neighborhoods on both sides of the central section of Sugarland Run between Elden Street and Wiehle Avenue. The full loop passes the front of Herndon High School while the short loop passes through neighborhoods close to the school but remains primarily within the park area on the western side of Sugarland Run. All but one of the Sugarland Run stream crossings in the park system are on columns rather than bridges. Walkers should have a good sense of balance and shoes with good traction. This route uses the only pedestrian bridge across Sugarland Run between Elden Street and Wiehle Avenue except for the bridge at the Stuart Woods Apartments near Elden Street. The return portion of the walk crosses Sugarland Run on columns. 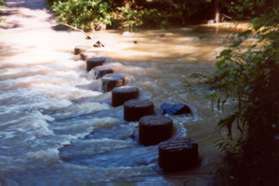 After a heavy or prolonged rain the water level may be too high to cross on the columns. Click here to view a crossing after a heavy rain. The bridge is always available for a return route should the other crossings become a problem but you may have to walk considerably further than planned. The walk starts from Stuart Road Park. It is on Lake Newport Road just west of Stuart Road. There is some parking available in the park plus street parking is available. This is a small Fairfax County Park located within the boundaries of Reston. Starting from Stuart Road Park turn to the left on the sidewalk along Lake Newport Road. You should be walking downhill. At the bottom of the hill cross the street and enter the asphalt trail adjacent to the driveway serving the houses beginning with12016 Lake Newport Road. The asphalt trail turns to the right and connects into the end of Coat Ridge Road. You have just left Reston. Take the sidewalk on the left side of Coat Ridge Road. You should cross Forbes Glen Drive and Cheviot Drive. Turn left at the intersection of Heather Down Drive and follow the sidewalk to the end of that street. At the end of the sidewalk take the asphalt trail between the houses to the left. The trail will enter the woods and go down a steep hill. The trail crosses a bridge over Sugarland Run. After crossing the bridge turn right onto the asphalt trail. Do not use the trail to the right prior to the bridge. The trail follows Sugarland Run and soon turns to the left. Turn left at the next asphalt trail intersection. It will continue through the woods for a short distance. The trail comes out behind some houses. The house shown has an invisible dog fence. At the next asphalt trail intersection the route splits between the high school route (full loop) and the short loop. Turn right to take the full loop and go to point 11. Turn left to take the short loop and go to point 28. (Full loop) The trail climbs the hill behind the houses. The trail intersects with Kingsvale Circle. Turn right and follow the sidewalk past Valebrook Lane until reaching Kingstream Drive. At Kingstream Drive turn left and follow the sidewalk south along that street. The sidewalk along Kingstream Drive will curve to the right after intersecting with Kingstream Circle. Continue along Kingstream Drive. At the end of Kingstream Drive cross the second appearance of Kingstream Circle and follow the sidewalk on the other side to the right. Continue until the houses end on the left. Herndon High School can be seen diagonally across the street. Remain on the present side of the street across from the school. The sidewalk should turn to the left away from the street. Take the concrete sidewalk leading back from the road and to the left to join an asphalt path behind the houses. You are now in Herndon. Herndon High School is in Fairfax County at the boundary with Herndon. At the end of the asphalt path the trail turns right along a fence and intersects with Huntsman Place. Turn right to follow the sidewalk along Huntsman Place. Turn left at Old Hunt Way and follow the sidewalk for one block. Turn right at Crest Drive and follow the sidewalk for one block. Turn left at Herndon Parkway and follow the sidewalk for one block. Turn left at Cavendish Street and follow the sidewalk to the end of the street. Take the asphalt entrance trail at the end of the street. Turn left where it joins the main trail (Hunter Creek Trail). Stay to the right at the next asphalt trail intersection. The trail to the left is a dead end. Continue straight at the intersection with the Hunt Way Path (next asphalt trail to the left). Turn sharp right at the next asphalt trail. You have just left Herndon. The short loop joins with the full loop here. Go to step 32 in the instructions. (Short loop) The trail passes a tot lot and goes between the houses. The trail crosses Eddyspark Drive. Continue on the trail on the other side of the road. At the next asphalt trail intersection turn right. After a short distance the trail curves to the right as a trail intersects from the left. Turn sharply left to follow the intersecting trail. Do not take the trail into the driveway. A trail intersects from the left. Continue straight on the present path. Continue straight past 2 more asphalt trail intersections from the right. Turn left at the next trail intersection. The trail slightly to the right enters Runnymede Park and is the return portion of the full loop. (Both loops rejoined) The trail crosses Sugarland Run on columns. You are now back in Reston. The trail crosses another stream on columns. The picture shows the crossing under higher than normal water conditions. Turn left at the next asphalt trail intersection after the stream crossing. The path will shortly curve to the right and follow the last stream that was crossed. The path turns left and crosses the stream over a bridge. It then goes between the houses to Lake Newport Road. Cross Lake Newport Road and follow the sidewalk on the other side to the right. Take the asphalt trail to the left near the end of the road. After a short walk the trail will enter the parking area in Stuart Road Park where the walk started.